The Peregrines in Michigan (and elsewhere) have braved some very tough weather in the last week. Unprecedented cold, ice storms, fierce winds from the northeast, freezing rain, and snow. The Kalamazoo falcons have done an outstanding job of staying on the eggs with very fast transitions between Rebecca and Kewpee for incubation duty. All four eggs remain intact and in place in the nest box. The first egg was laid on March 16, so hatching could start any time. Some of our neighboring Peregrine nests have not fared as well. The Grand Haven nest had one egg as the severe weather started. One screen shot showed the female standing next to her egg and both were completely drenched. Later that night she continued to be pelted by freezing rain, and you could see ice forming on her feathers. She left the nest and the egg disappeared, perhaps stuck to the ice on her feathers. The pair have been seen back at the box and maybe will try again. 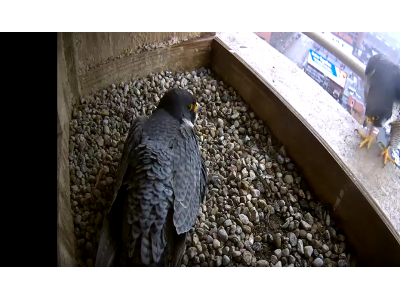 There were four eggs in the nest at Grand Valley University in Grand Rapids, however, two of the eggs have disappeared.